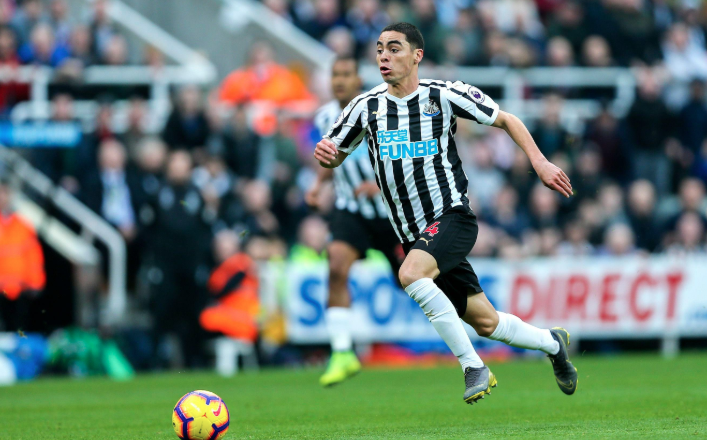 Stunning Miguel Almiron stat emerges from his first 6 games at NUFC – This is so impressive.. – NUFC blog – Newcastle United blog – NUFC Fixtures, News and Forum. Miguel Almiron has created an average of 3.25 chances per game over his first 6 appearances for the club – a figure not one Premier League player has bettered since his arrival in England. While Almiron has shown more than enough promise over his first five starts for the club, there’ll be some who will only be convinced once he starts finding the net – but this stat will silence anyone questioning his contribution so far. “A lot of eyebrows were raised when Newcastle signed the Paraguayan playmaker for a club-record £20million in January. “But he has been brilliant for the Magpies and that was once again the case against Bournemouth. He came close on several occasions on his debut at Huddersfield, and although he’s not looked too much of a goal threat since then, he’s more than made up for that in his ability to create. Creating chances is one thing, but one thing I’ve been hugely impressed by is his ability to create space – with him movement out wide and in behind helping both Rondon and Perez thrive, also giving Matt Ritchie more room to work in from a left wing-back role. Not only that, his 60-yard burst at Bournemouth – which resulted in a foul and a free kick that Rondon converted – showed just how devastating he can be on the counter, with him possessing the rare trait of looking just as quick with the ball as he does without out. Not only does he look like an exciting talent who will only get better, he seems like a down to earth lad and a real team player. It’s easy to see why he was Rafa’s top target.